Israel has expressed concern over Iran’s growing influence in Syria, accusing Iran of seeking to establish a foothold near the frontier with the Jewish state. The United States has been pressing for Iran to withdraw its fighters from Syria. In recent meetings between U.S. and Russian officials, President Donald Trump’s national security adviser John Bolton said he and Russian officials are discussing ways to do that, without providing details, calling it a U.S priority. Iran displayed a new twin-seat fighter jet Tuesday, saying it’s all Iranian-made and with advanced avionics and fire control systems. The country’s president said it would enhance Tehran’s deterrence capabilities in confronting Washington. His comments came at the start of a two-day visit to Syria, where he met with the Syrian President Bashar Assad and other senior officials. The high-level military delegation headed by Hatami is expected to boost cooperation between the two countries, and Iranian media reported the two are expected to sign new military and defense agreements. 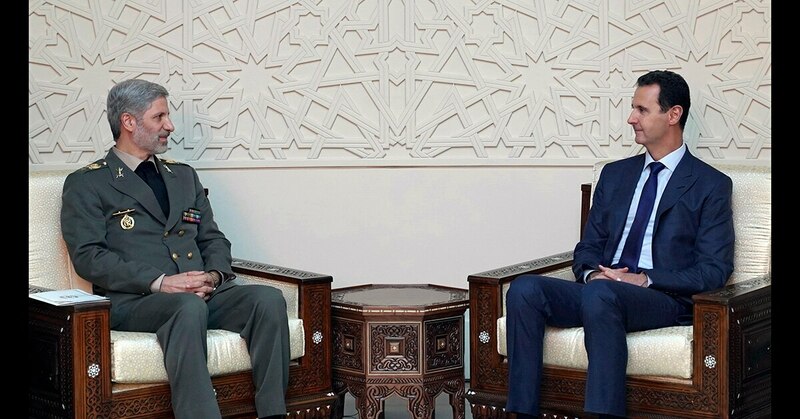 “Iran will spare no effort to maintain Syria’s territorial integrity, because security in the country will help (improve) regional stability,” Hatami said in a meeting with his Syrian counterpart, Gen. Ali Abdullah Ayyoub, in Damascus on Sunday, according to Press TV. He later met with Assad.